First Parish functions as a Shared Ministry. We thrive when everyone contributes their unique talents to the greater community. Below is a list of committees and teams where you can become involved. This multidisciplinary list has a role for everyone, no matter your strengths or interests. Click the link at the end of any listing for more information. Building & Grounds (B&G) is responsible for ensuring that the home of our First Parish community is safe and secure and continues to be aesthetically beautiful inside and out. More specifically, B&G is responsible for maintaining the building and grounds, managing buildings rentals, undertaking capital projects, and keeping the building and grounds safe and secure. Work is carried out by various subcommittees and coordinated by the B&G Steering Committee. We always welcome new members to join B&G subcommittees. The B&G Steering Committee includes representatives from the subcommittees. Volunteer time commitments vary by subcommittee. Board members serve as the elected lay leaders of the congregation. In that role, their responsibilities include ensuring that the church is fulfilling its mission; representing the congregation as the public face of First Parish; reviewing and making policy changes, as necessary; and monitoring performance against goals and objectives. Board members spend approximately eight hours per month on board business. They are also expected to be highly visible in the congregation and regularly attend church services and special events. The First Parish monthly newsletter, The Focalpoint, is one of the major points of communication about all that is happening at First Parish. Published quarterly, it features upcoming events, programs, and committee work, as well as highlights of past events. Publishing the newsletter requires about 4-6 hours every three months. Knowledge of Publisher, conversion software, and email marketing is desirable, but will train. The finance committee oversees the financial life of the church. The committee reviews monthly financial statements, produces the first draft of the annual budget for the church board, makes financial recommendations to the board, and participates in the annual canvass. We spend an average of three-four hours per month on committee business, including a 90-minute monthly meeting. Demands may be slightly higher during the canvass. The Great Fall Auction Team plans and runs First Parish’s biggest fundraiser, our fall auction. Roles include a chair, vice chair, catalog lead, operations lead, operations helpers, bid runners, silent auction helpers, proxy bidding lead, food and beverage lead, food and beverage helpers, bartenders, and set-up and clean-up helpers. We have a fabulous how-to manual covering everything you need to know about how to run the Great Fall Auction including recommended roles and responsibilities, key activities, timelines, and more. The History Committee preserves First Parish’s History in the church archives. The Committee helps with any history questions and has special projects like working on our “Book” which is a history and description of the physical church, its origins, the ministers, and its philosophies. Committee members spend a few hours per month on committee activities. When there is a special project, we meet more often. We usually meet at 1:30 pm on the second Wednesday of the month, but we are flexible and could meet after church on Sunday. The Hospitality Committee sets up and maintains the Sunday Social Hour hosting calendar. Volunteers with computer skills and a willingness to get to know congregants are always welcome. Volunteers spend three or four hours working on the calendar in August and January, and about an hour a month during other months. The Committee on Leadership and Service is responsible for leadership training and development, recruiting volunteers to fill standing committee openings, and for presenting to the congregation candidates for vacancies on the Parish Board, Parish offices, and Trustees to the congregation. We spend an average of three-four hours per month on committee business, including a 60-90 minute monthly meeting. We also welcome Leaders/Facilitators for various Adult Programs, and we always welcome new members to the LRE committee. This involves one 1.5 hour meeting per month and other short commitments of time during the church year. Mayfair is an annual fund-raising activity typically held in May on the Saturday before Mother’s Day. Normally the Mayfair ball starts rolling in February with planning publicity and enlisting chairs for the various tables and activities; the final winding-up work should be finished about a week after Mayfair. Previous Mayfair chairs are available to consult and mentor, and they have compiled a Mayfair Handbook to guide you through the process. Two co-chairs meet weekly for two hours to report on goals met during the week and/or to have a joint working session. As other table/activity leaders come on board, you’ll delegate tasks to them. You can also enlist help from the parish administrator, the sexton, and the communications liaison. The Members and Friends Committee welcomes guests, introduces them to our church community, and encourages them to become members. 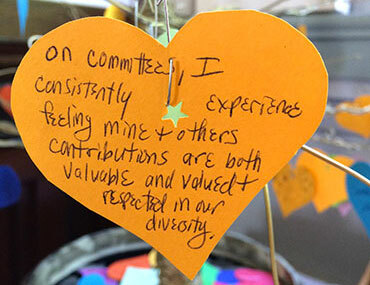 We offer New UU workshops, encourage newcomers to become members, and participate in new member recognition ceremonies. Committee members spend no more than 3-5 hours/month on committee work, such as participating in new member drop-in sessions, ensuring that the necessary materials are in the pews prior to each service, organizing an Activity Fair to recruit new volunteers, helping new members and friends connect to First Parish through electronic media, and making nametags for new members & friends. The Music Committee oversees the musical side of spiritual life at First Parish. Committee members catalogue, file, and distribute our sheet music, market upcoming concerts, serve as concert ushers, and prepare Parish Hall for receptions after concerts. The Personnel Committee provides guidance to the Parish Board on personnel issues such as compensation and benefits, job descriptions, and job performance issues. Members spend an average of two to three hours per month on committee business. The Pledge Drive Team is responsible for organizing the annual giving campaign each year. We work with the Board and Finance Committee to create the strategy and plan, create the calendar of events, and engage with Members and Friends to collect their financial commitment to First Parish. We also coordinate kickoff and celebratory events to make the Canvass successful. In addition to a member of Finance and a member of the Board, we typically have 3-5 additional members. Time commitment is approximately 2-4 hours per week between November and April. The Publicity Team, working with Parish staff, plans and executes external publicity for First Parish events, such as music concerts, lectures and forums, and Mayfair. The team develops of publicity plan for each event, writes and edits articles for the news media, posts to the First Parish web site, and otherwise publicizes the event, for example with banners, posters, and flyers. The Chair, with the Parish Administrator, coordinates the publicity. Team members write one or two articles a year, which are then edited and sent to the appropriate media by others. The work is episodic and is mostly done via email, phone, or Google Docs. The Social Action Committee plans and coordinates First Parish’s social action initiatives. We serve as a clearinghouse for volunteers to work together on projects that make a meaningful difference in the lives of people and places in need. See our Justice section for more information. We always welcome new members! You don’t have to join a committee to share your gifts. Consider coordinating flowers for our weekly worship services or decorating the sanctuary for our Holiday services. Your ideas are welcome too!